Vitamin D: Why Is It Important and Where Can You Find It? Vitamin D is an unconventional vitamin for two reasons. The first reason is that our bodies are able to make vitamin D with exposure to the sun. The second reason is vitamin D, when in its active form calcitriol, has a hormone-like effect on mineral absorption, bone mineralization, and various secretions. Vitamin D is important for bone and muscle health, immunological activity, cancer risk, calcium levels, and cell activity. Vitamin D is probably best known for its role in maintaining bone density. When combined with calcium, vitamin D prevents bone loss and promotes an increase in bone density. This helps reduce the rate of hip fractures, which has not been seen with calcium supplementation or hormone therapy alone. The improved bone mineralization is directly correlated to an increase in longevity and quality of life. Vitamin D is also important in dental health and maintaining strong, healthy teeth. Vitamin D is also important to maintain calcium levels. The active form of vitamin D works with parathyroid hormone (PTH) to maintain calcium levels in the blood. It does this by increasing intestinal absorption, increasing reabsorption of calcium by the kidneys, and stimulating the release of calcium from the bones when levels are low. It also works in the reverse manner if levels are too elevated. Vitamin D has been recognized to have antitumor properties. In previous studies, vitamin D supplementation resulted in pancreatic cancer risk to be reduced by half in both men and women. In addition, colorectal cancer risk was reduced by half in women with increased levels of vitamin D in combination with calcium. Vitamin D has an immunological benefit by preventing excessive inflammatory activity. Our immune cells have receptors for vitamin D, specifically our T cells. This is significant because many autoimmune diseases have a T cell component. Vitamin D therefore plays a role in the prevention and treatment of diseases like Type 1 diabetes, multiple sclerosis, and rheumatoid arthritis. The color key represents the likelihood of Vitamin D synthesis in February. Dark blue indicating it is more unlikely and Red indicating it is likely. The largest factor related to a vitamin D deficiency is limited sun exposure. This could be for a variety of reasons including being homebound, living at northern latitudes, use of sunscreen, full body coverage of clothing, and occupations without sunlight. Darker skin tones also contribute to vitamin D deficiency because of the increased melanin. Symptoms of insufficient vitamin D levels include altered muscle function, malabsorption of calcium, rickets, hypocalcemia, osteomalacia, osteoporosis, bone irregularities, and autoimmune diseases. 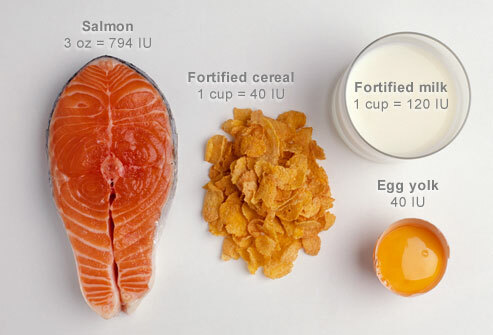 Foods are generally low in Vitamin D with the richest foods being fish liver oils and fatty saltwater fish. These include sea bass, halibut, swordfish, herring, tuna, and cod. Other sources include sardines, shrimp, and eggs. Milk and dairy products can be a good source because they are often fortified with Vitamin D.
There are several recommendations that quantify the amount of nutrients that we need on a daily basis but we are interested in the Recommended Dietary Allowance (RDA) and the Optimum Daily Intakes (ODI). The RDA is 600IU for vitamin D and the ODI is 1000IU. Careful attention needs to be applied to our diets to ensure that we are consuming as much of our vitamin D through a whole food diet as possible. Supplementation can aid in meeting requirements, but we cannot rely solely on them because of the significant number of nutrients not yet identified. Lieberman, S & Bruning, N. (2007). The Real Vitamin & Mineral Book. (4th edition). New York: Avery. Mateljan, G. (2007). The World’s Healthiest Foods: Essential Guide for the Healthiest Way of Eating. (1st edition). Washington: GMF Publishing.